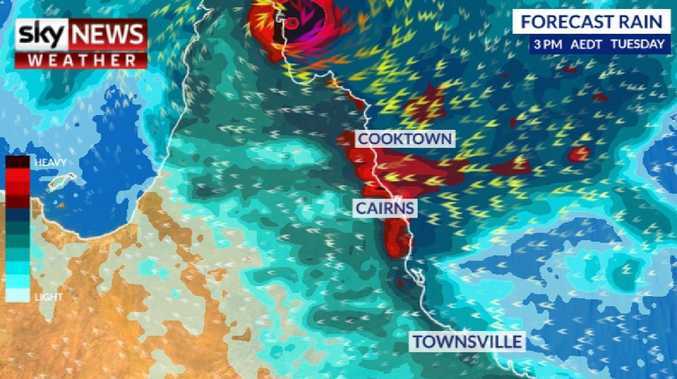 Tropical Cyclone Trevor is set to cross the Queensland coast as early as Tuesday evening. Slow moving, it could bring a deluge of rain to the state's north over the coming days. But the entire east coast could cop a lashing at some point with severe storms and heavy rain on the cards. That comes after parts of Sydney and Brisbane were hit with an entire month's rain over the weekend - sometimes in just a few hours. Sydney's CBD saw 118mm of precipitation across Saturday and Sunday with a hefty chunk of that pouring down on Sunday morning. The average for March is 101mm in the city. You have to go back to March 2012 to see as much rain in a single day as the 75mm that fell on Sunday alone. The Gold Coast's rain gauge swelled to 159mm on Sunday with the majority falling in a three-hour stretch from 4.30pm. That easily beat the monthly average of 110mm. Tropical Cyclone Trevor is currently category one but is expected to strengthen before it reaches the coast. It's due to make landfall on the Cape York Peninsula south of the Lockhart River around 7pm on Tuesday. Only moving at 10km/h, it could pack a very soggy punch, depositing large amounts of rain and bringing destructive winds in an area from Cairns northwards. "It is likely to become a category two later today and is even a chance to reach severe category three before making landfall late tomorrow," Sky News Weather channel meteorologist Rob Sharpe told news.com.au. "The current forecast is for destructive wind gusts above 125km/h near the centre of the system. It will bring heavy rain, gales, abnormally high tides and large waves to the Cape Yorke Peninsula." The further north you are the soggier you are likely to get. 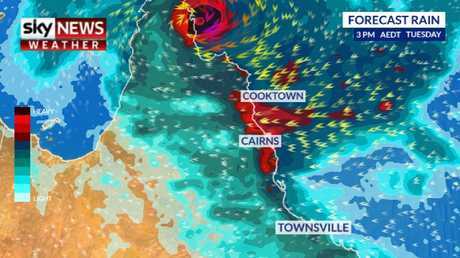 "Cooktown could see gales tomorrow and will see heavy rain this week, likely in excess of 300mm, with flash flooding likely," he said. "In Cairns, rain, showers and storms will be heavy at times this week, with a weekly total most likely between 200-400mm. 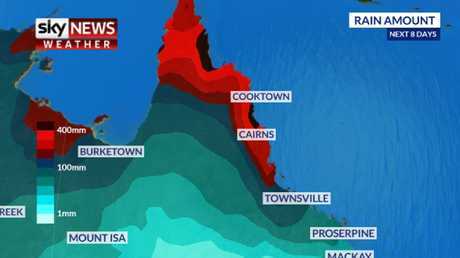 Thankfully, Townsville looks to escape the heavy falls with a weekly total likely to slot between 60-120mm." Mr Sharpe said the system would weaken as it tracked west across the peninsula but then strengthen once more as it passed over the Gulf of Carpentaria, the warm waters refuelling its engines. A turn southwest could then see it head towards eastern parts of the Northern Territory and western Queensland. While southern areas of Queensland may be out of the cyclone impact zone, that doesn't mean the weather is going to be settled. 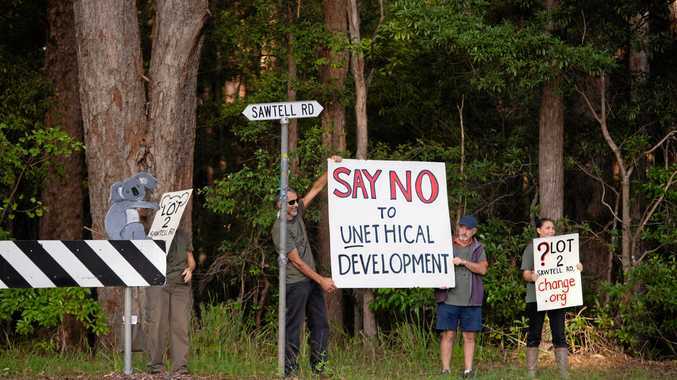 "There's the threat of severe thunderstorms from Bundaberg to Brisbane," Mr Sharpe said. It will be a warm week in Brisbane, reaching 33C on Tuesday and Wednesday, but storms are a possibility just about every day with 15mm expected today. "There will likely be further storms and showers for New South Wales and Queensland for the following days, on and off, and we could see the odd severe thunderstorm in the afternoon and evening," Mr Sharpe said. Today, the worst of the rain in NSW will be on the south coast. But Sydney could see showers still with the threat of rain only really easing towards the weekend. Temperatures around the mid-20s are expected in the Harbour City. Similar conditions to Sydney are forecast in Canberra this week with showers but some sun creeping through. Temperatures should hover around 23C today and then 26-27C for the rest of the week. It's far more settled south of the Murray. Melbourne will see pleasant autumn days with temperatures getting to the late 20s this week. Across the Bass Strait expect some showers. It will be around 20-23C in Hobart with some sun creeping through. It's warm and sunny in Adelaide with most days just tipping into the 20s. Perth will be the standout in terms of heat. Expect 35C today and humid conditions. But it should start to cool as the weekend draws near. Expect mid-30s and storms in Darwin with a respite from the rain midweek.